photo courtesy of Michael Maslinski. The Garden House in Warren Park Road, Hertford,was home to the Maslinski family from the early 1950s for nearly 30 years.Yvonne Maslinska and her husband Major Jan Maslinski brought up 5 sons and a foster son and welcomed their many friends to the house in Bengeo. Yvonne was every inch the modern woman and led a startlingly full life for a woman of her time. 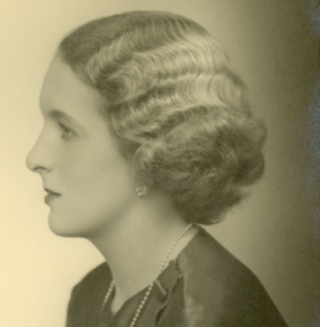 Born in 1916, Yvonne was the daughter of Lt. Col. Henry Medlicott and his wife Clare, who was a member of the Gosselin family, associated with Bengeo Hall and Ware Priory. Yvonne was naturally athletic, physically courageous and excelled at most sports, becoming captain of several teams at St Mary’s Convent School, Ascot. She was an accomplished and fearless horsewoman and enjoyed hunting from a very early age. Yvonne is described by her family as something of a rebel and spent a fair time at school escaping from windows in order to attend parties! At a time when relatively few women undertook higher education, Yvonne earned a place at London University to read German. Yvonne’s adventurous spirit led to her and a group of friends purchasing a car and travelling across Central and Eastern Europe in the mid 1930s. This was an unusual undertaking for a girl in her early twenties and a far cry from the extensive support available to gap year students today. As it turned out, this extended tour coincided with the rise of Nazi Germany and Yvonne actually witnessed Hitler’s arrival in Innsbruck. In her travels Yvonne fell in love with skiing, which was still in its early stages, often staying in extremely basic mountain dormitories in order to embrace her new passion. In her early twenties, Yvonne also learnt to fly. She took to flying like a duck to water and regularly took up tiger moths, obtaining her flying licence in 1938. Just before the Second World War, Yvonne undertook ferry pilot training with the ATA (Air Transport Auxiliary), but unfortunately when later asked to deliver aircraft for the war effort she was unable to complete the course, owing to a bout of Scarlet Fever. Yvonne was recruited by MI6 early in the war; it is unclear how this came about but her father, Henry Medlicott, was an ex army officer and director of a large oil company and perhaps there was an assumption by his contacts in the intelligence services that this made her a good security risk, she was also fluent in German and French. Yvonne was not a spy or a secret agent; her job was to coordinate reports coming in from intelligence officers in the field. Yvonne approached her role with her trademark enthusiasm, capability and sense of fun; her family recall her telling of the occasion when the secret papers she was preparing for M, caught by a gust of wind, flew out of the window. Yvonne dashed down to the street, collected the papers and took them home and ironed them! She also had a brief spell as a driver for the American Ambulance Service in London until she was sacked for taking the ambulance to the pub! Even in the midst of the war Yvonne enjoyed a very active social life and on one occasion when the blitz was particularly bad she and some friends decided they couldn’t waste a crate of rather good champagne. Upon waking the next morning, Yvonne was surprised to notice all the doors of her flat were open and a large piece of concrete had materialized in the kitchen. This turned out to be a piece of the platform of Charing Cross Station; amazingly she had slept through the whole raid! During her time with MI6 Yvonne was introduced to Major Jan Maslinski. Following the invasion of Poland, Jan had escaped to Britain and, fluent in five languages, had been recruited by British Intelligence. Jan was a professional soldier dedicated to the effort to liberate his country and is believed to have undertaken missions abroad gathering intelligence from Eastern Europe and organising sabotage of infrastructure in German-occupied countries in Western Europe. Described as highly intelligent and a natural athlete, he and Yvonne seemed an ideal match. They married in the Lady Chapel of Westminster Cathedral in 1943. As the wife of a Polish exile, Yvonne was officially stateless until her British nationality was restored by a change of law many years after the end of the war. Following her marriage, Yvonne worked for the Polish Information Service, an organisation which sought to obtain and communicate a truthful account of the situation in wartime Poland, where firstly the Germans and then the Russians were inflicting a variety of atrocities in suppressing the native population. In February 1945, with the end of the war in sight, Churchill, Roosevelt and Stalin met at the seaside resort of Yalta in the Crimea to discuss the government of post war Germany and the reestablishment of European nations. The concessions made to Stalin at the Yalta conference laid the foundations for the Cold War and dramatically affected the lives of millions, including the Maslinskis. Jan had always intended to return to Poland where his parents and siblings still lived. However, having supported the Polish Government in Exile, now unacknowledged in favour of a pro-Communist Polish government assembled in Moscow, Jan could not go back, although later on Yvonne was able to travel to Poland with two of her sons to meet her in laws. It would be many years before Jan finally became a British citizen and was thus able to return to Poland without fear of being detained by the authorities. Jan retired from British Intelligence and the family, which now included two small boys, left London and lived for a time on the Blaskesware Estate, Wareside, the home of Yvonne’s Aunt. Two more sons followed and Yvonne was persuaded by her sister to look at a house in Bengeo which had come up for sale. Yvonne fell in love with the Garden House but felt sure it would sell for more than they could afford; fortuitously it did not and the family moved in. The house and garden were large and a struggle to maintain, particularly with four sons and a new baby, but Yvonne took it in her stride. Jan, who had started an estate agency in Knightsbridge, spent most of the week in London and Yvonne managed the household almost single handed on a relatively small budget. Yvonne shared her sense of adventure and love of sport with her children and holidays were often spent skiing, camping, sailing and horse riding. Yvonne filled any spare time she might have had volunteering with local branches of charities such as Oxfam, Save the Children and Sue Ryder. A young Polish boy who arrived as a holiday guest stayed on, becoming the Maslinski’s sixth son. His parents were trapped in Germany after the War and it must have been an enormous comfort to them to know he was being loved and cared for by a sympathetic Polish family. The family lived happily in Bengeo, the home of Yvonne’s Gosselin family roots; the garden was large and friends and neighbours old and new were welcomed for drinks, meals or tennis. Sadly Jan passed away in 1974 at the age of 59 and with her children now grown up, Yvonne was looking for a new challenge to fill her time. It was suggested that she try her hand with the Citizens Advice Bureau in London and Yvonne’s determination and sense of fair play made her ideally suited to the advisory role she undertook for 15 years. In 1982, Yvonne took the decision to sell the Garden House and retire near the coast. She settled on a lovely little house in Bransgore, Hampshire, two miles from the sea and near to where she had taught the children to sail. Yvonne threw herself into retirement wholeheartedly; she loved the sea and would swim and sail regularly from Keyhaven in her dinghy. She soon made friends in the village and received regular house guests. Yvonne’s sense of adventure never left her and on her 80th birthday in 1996 her sons arranged for her to be taken up in a Tiger Moth. Yvonne joyfully looped the loop twice over the Solent and enjoyed reliving her flying experience so much that the same was arranged three years later for her 83rd birthday. Yvonne passed away in 2009 at the age of 92. In her lifetime the world had changed and changed again. Yvonne was a real woman of the 20th century; intelligent, fun-loving, courageous and intent on being heard. Thanks are due to the Maslinski family, and in particular Michael Maslinski, for sharing their memories of their inspirational mother with Hertford Museum and allowing me to share her story with others. Also see The HHH Post on: The Atagirls (Aviation Transport Authority) World War Two.